When did you last read a demoscene magazine on paper (Hugi printouts don't count)? Probably not recently, unless you were at Assembly or were otherwise lucky enough to get your copy of Altmag. This black and white magazine contains 76 pages of text and illustrations. A lot of the content is related to the demoscene or computers, but not all of it. Altmag also includes short stories and poetry, so it's a bit like Hugi. Alternative Party Ry is a Finnish organization behind the second biggest party in Finland, the Alternative Party. It also carries out other wild projects, which aren't necessarily exclusive to the demoscene. The idea of Altmag was presented in spring this year and the submission deadline was set to the 1st of July. The release was planned for Assembly, to guarantee a big target group. Like it often happens with projects, stuff was accepted long after the deadline, even still in August. The DTP was done in Tuesday and Wednesday the week of Assembly, the files were transferred to the press on Wednesday and Ravel fetched the magazine boxes on Friday. I was happy to pick up the first copy and a second one for my little sister. The price was set to a feasible 2 euros, though contributors received a free copy. The magazine starts with editorial by Setok, the vice-chairman of Alternative Party ry. Dbug of Defence Force has written a longish article about the Oric demoscene. There are two less serious scene articles, the first one is "Eliteness Uncovered" by yours truly. It reveals a newly found algorithm that calculates the eliteness percentage of a scener and uses some famous sceners as examples. ABHO's text is a fictional (or how can we know?) party report of an alcohol abuser, written in diary format. Other computer-related texts include one about Ada Lovelace, the first female geek. Viznut has written an interesting article about binary systems, from stone age to the present. Assembly has been the inspiration for two articles. "Our future" is about the seminars at Assembly, written by Antti Silvast / Bandwagon. Setok and Ravel have interviewed the Assembly main organizers Pehu and Abyss about demos and demoparties. There's also a photo of Pehu and Abyss at Boozembly. 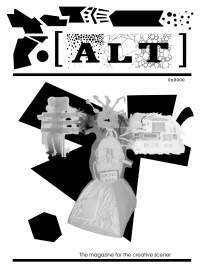 Altmag contains two MSX articles, the first one being about the past and the future of the legendary computer. The second one is a review of the game Nemesis 3: The Eve of Destruction, citing it as "another reason to buy an MSX - if you do not have one yet". There's another gaming article as well, a roguelike game called Whack for the VIC-20, written by Aleksi "Heatbeat" Eeben. The whole source code is included after an introduction to the game. Olli Stålström has written a history for publishing alternative magazines, in this case magazines about different sexuality issues, quite an interesting read. There is also another real world article in Swedish about the university system, but due to an error only a portion of the article ended up printed. The "fun section" includes a movie quote trivia by Ravel with such gems as "And this is 1976, there's no CNN, there's no CNBC, there's no Internet!". There's a cryptogram (a form of a crossword) by me, carefully composed first on paper, then HTMLized in OpenOffice and finally converted to Postscript on Linux. Too bad there's a note that the crypto is in Finnish, when in fact it's in English. As for literature, there are poems and short stories. My two poems Seamstress and Origin of species suffered in the press, they were rendered almost unreadable by their raster background. Setok has written a scifi story called Invite Them Over For Tea, Hilda, some elements of which remind me of Douglas Adams, even though it's more serious. Osyn's piece is called Seinä (The wall). It's actually the only text in Finnish and the style resembles scifi/fantasy well, it could be intepreted as an essay of drugs and the society - or however you wish. Altmag is not commercial and the only real ad is a small, banner-like ad for Fishpool Creations. Kokeellisen elektroniikan seura (an organization for experimental electronics) is advertising on page 35, and there's a big ad for the next Alternative Party on the back cover, with the slogan "alternative digital media with an attitude". You can also spot a plug for Cafe 2003, which was held in Kazan, Russia, in September. The illustrations are as colorful as black and white ones can ever be. I have to say that I don't really think the cover picture is that stylish, but at least it's alternative. Almost all articles include screenshots, photos and drawings and there are also three pages dedicated to pictures. One of them is "Unssi-Art", two computer-drawn caricatures of unseen fate/Jasoft by my little sister. ASCII art is featured with a picture of mine called Scenedragon (it was originally the Pokémon Charizard, but I added some tattoos, booze and the text "ALT" inside its flame). The last page features a picture of a woman by marycloud. There are also compo entries from different Altparties and Altzones all over the magazine, analogue graphics art by Aropupu and spiikki and an analogue ASCII Tux by Blizzie. The problem with many of the illustrative pictures is that they're from the Internet and thus suffer from JPEG artifacts or similar quality issues. But the lack of colors is not a problem. Altmag may not look totally professional, but it is unique and interesting. Unfortunately it may prove quite difficult for you to obtain a copy if you don't live in Finland, but there's a chance the articles will be online some day. As it is, the Altmag homepage only contains the editorial and the article in Swedish, which was not printed in full. Hopefully the next issue of Altmag will see the daylight on January. Everyone is allowed to contribute and your choice of language is not an issue.